Planthouse featured Olsen in its second show in 2013—it was his last solo show. In April of 2014, Olsen died in his sleep of a heart attack. He was forty four years old. Olsen was living with his parents outside of Sacramento and was in the process of studying the freeways along his commute to The Art Center in Pasadena where he was teaching at the time. After his show at the gallery, Planthouse had initiated a print project with the artist and corresponded with him over the fall and winter. 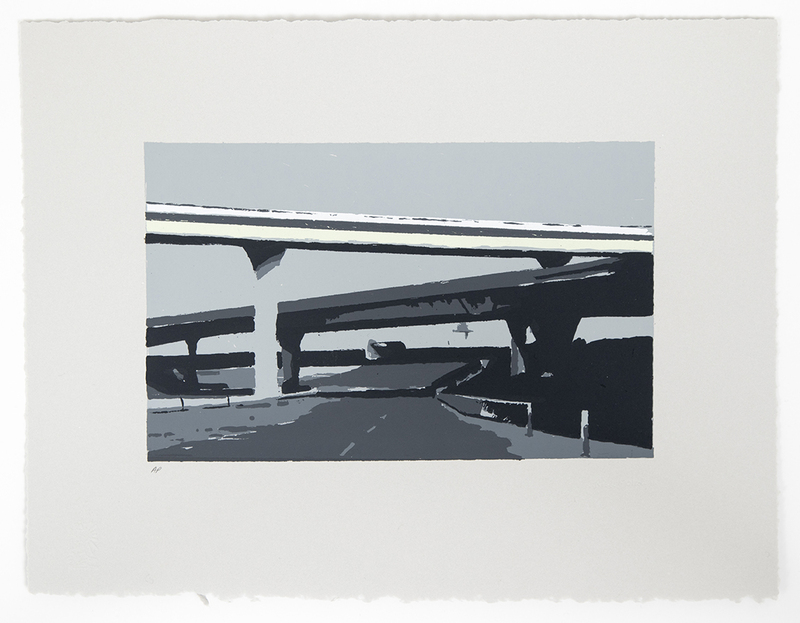 The deserted freeway is the subject of his first and only print, and it captures the haunting beauty typical of his work in a loose, almost unfinished, way. 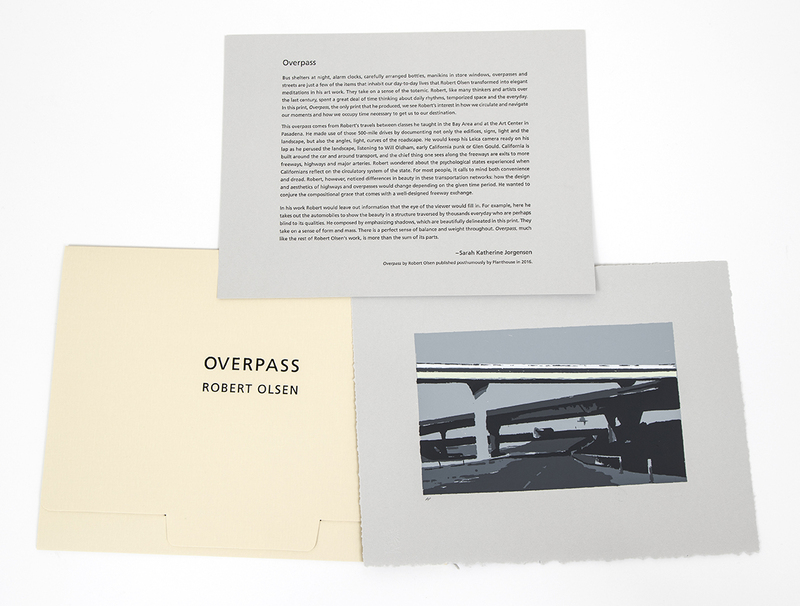 The print, entitled Untitled (Overpass), is a snapshot into the reclusive world that Olsen uniquely admired and studied. Rather than converting a photograph into a color-separated screen print, Olsen painted directly on mylar film, effectively applying his painterly hand to the printmaking medium. He had sent the films to Planthouse but died before the print could be realized. 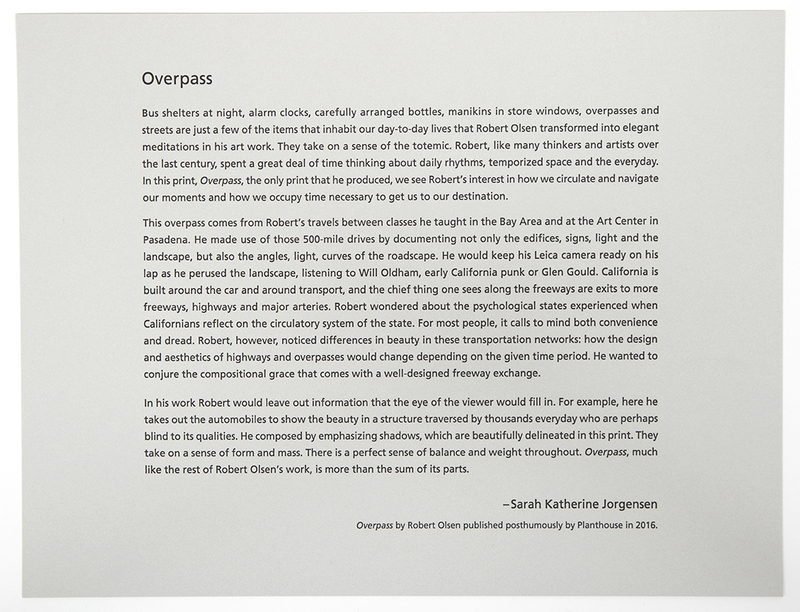 Untitled (Overpass) was printed posthumously with the aid and care of his parents, Robert and Sandy Olsen. It is an edition of thirty, blind-embossed with Olsen’s signature and signed and dated on the verso by his father. An essay printed letterpress by art historian Sarah Jorgensen, Olsen’s fiancée, accompanies the print. Robert Olsen received his BFA from California College of Arts and Crafts in 1998 and his MFA from the University of California, Los Angeles in 2002. While in college he started showing paintings through the Susanne Vielmetter Los Angeles Projects gallery. He would later have solo shows at: Black Dragon Society, LA; Plane Space, NY; G Fine Art, Washington DC; and Monte Clark Gallery, Vancouver and Toronto, Canada. He was in group shows at: H2O LA; University of North Texas, Denton; Luckman Fine Arts Complex, Cal State LA; Marcello Marvelli Gallery NY; ArtForum Berlin, Germany; Hayworth Gallery LA; Skidmore College, Saratoga Springs NY; Monterrey Mexico; Reed College, Portland OR; Silas Marder Gallery, Bridgehampton, NY; Hartford Community College, Bel Air, MD; CCA at 100, Braunstein/Quay Gallery, San Francisco, CA; Nathan Larramendy; Ojai, CA; Ars Libri, Boston MA; The Green Gallery East, Milwaukee, WI; ACP LA; Silverlake, LA, CA; Torrance Art Museum, Torrance CA; Wonderloch Kellerland, Berlin Germany; Anne Marten’s Home, LA; and Begovich Gallery – CSU Fullerton, CA. His last solo show was L.A. Freeways at Planthouse, NY, and curated his last group show, “I, II, III”, at South of Sunset, LA. Public Collections: The Beinecke Library, Beinecke Rare Book & Manuscript Library, Yale University, New Haven, CT; The Metropolitan Museum of Art, New York, NY.